The Sinful Brides series follows the sizzling romances of the men who run one of the most notorious gaming hells in 1820s London—and the women who scandalously fall in love with them. In a place where lords rule polite society and ruthless men lead the underbelly, women are often left on the fringe. Only the most daring among them break free of their restrictions. 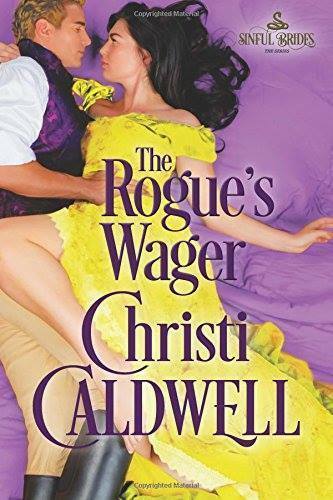 The Sinful Brides series follows the sizzling romances of the men who run one of the most notorious gaming hells in 1820s London—and the women who scandalously fall in love with them. Lord Robert Dennington, the Marquess of Westfield, has long reveled in the freedom afforded him as the ducal heir. He knows he must someday do right by the Somerset line, but he’s in no hurry to give up his carefree existence. Helena Banbury is a bookkeeper in a gentleman’s gambling club, adept at analyzing numbers and accounts but helpless for lack of influence. She’s never belonged among the nobility on the gaming hell floors, but neither does she feel completely herself among the men who run the Hell and Sin Club, despite the fact that they are family. The once-illiterate girl from the streets wants more than the gilded walls her protective cage can offer. When Robert mistakenly enters her chambers one night, Helena is forced out of her predictable life and thrust into the glittering world of Society. Will the charms of the marquess prove more perilous than any danger she ever knew on the streets?